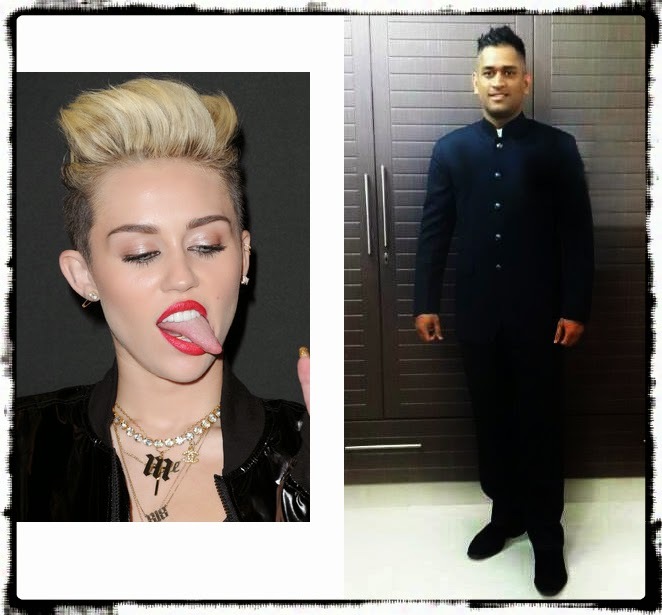 Mahendra Singh Dhoni is known for his different hairstyles. When he entered the cricketing scene, he sported a Andre Agassi hairstyle. Later when he found that his hair was blocking his view, he cut his hair short and even sported an Andre Agassi bald look for some time. But then when it was time for his marriage he had a normal hair cut. Today he was invited by our respected Prime Minister Narendra Modi for his swearing in ceremony. Dhoni wore a beautiful suit for the occasion. But he chose a hair style which was introduced by Miley Cyrus. Apparently Miley Cyrus is the Guinness world record holder for the person with the longest tongue. Scientists have found out that he tongue is even longer than the tongue of a T-Rex dinosaur. When I was first introduced to Gatsby hair gel, this is how I used to style my hair. After applying too much of gel, my head would start aching so much, that I would eventually take a shower and rinse off all the gel in my hair. Dhoni might do the same thing tonight. It was a great sight to see all the religious leaders in saffron robes sitting in the front row during Narendra Modi's swearing in ceremony. But my heart started to ache when I could not see Angel TV Sadhu in that row. May be he was not invited. On second thoughts, I realized that he would have been invited; but our Sadhu would have been busy discussing about end time matters with his angel friend. When Smriti Irani, took the oath, my eyes welled up. She was defeated by Rahul Gandhi in the elections. But Rahul Gandhi proved yet again that he can empower women even when he defeats them. Finally, Dr Subramaniya Swamy did not get a cabinet seat too. He might have lost a cabinet seat; but he always gets a seat in Arnab Gowsami's cabinet. Newshour debates are gonna be more informative than ever.